I decided to keep things simple this year. We always have something fun cooked up on our first days of school. So I tried to be creative, yet keep things easy. I served them pancakes/German pancakes, some w/ chocolate chips, some plain. My “hint” was on the board… they didn’t know it. We opened up our day talking about the Fruits of the Spirit. I decided since we’ve had a few attitude-ish moments the last few months, that a lesson on each of the characters would be beneficial. 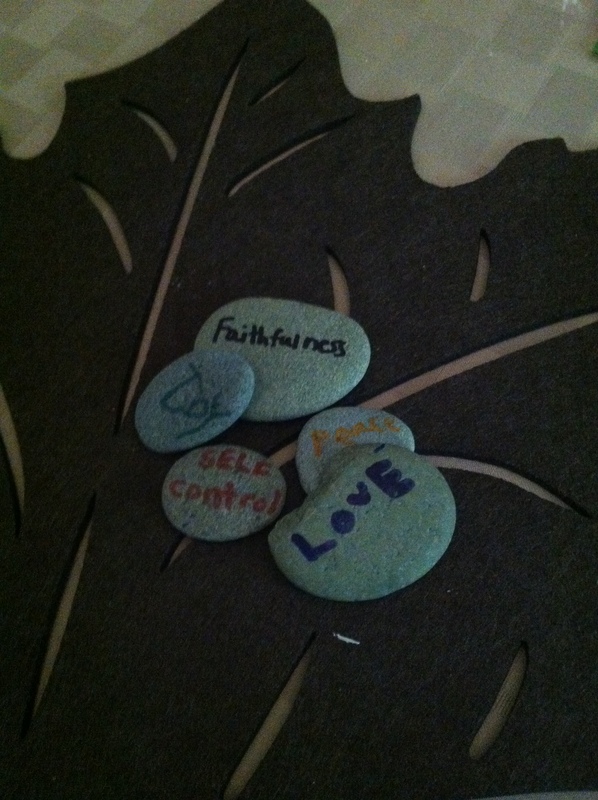 We had some flat rocks from a previous beach vacation, so I thought using them as “faith” rocks would be fun. I was hoping for a tool to engrave the small stones, but that didn’t happen, so the kids just wrote on the rocks with markers. As a service of good deeds the kids went outside to do some outdoor chores; sweeping the deck and driveway (we live in the woods, it’s daily task, lol), stack wood, scoop poop (aren’t puppies cute, ha), and rake tree debris. 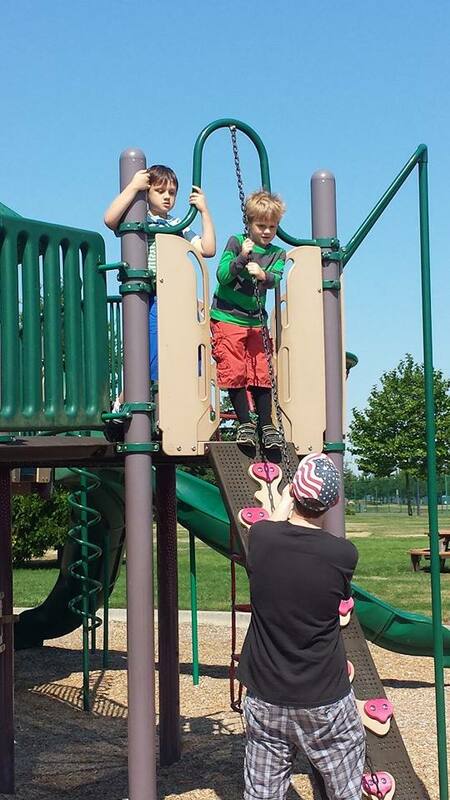 We ran down to the local park and played for 30 min. Tag always seems to be the game of choice. 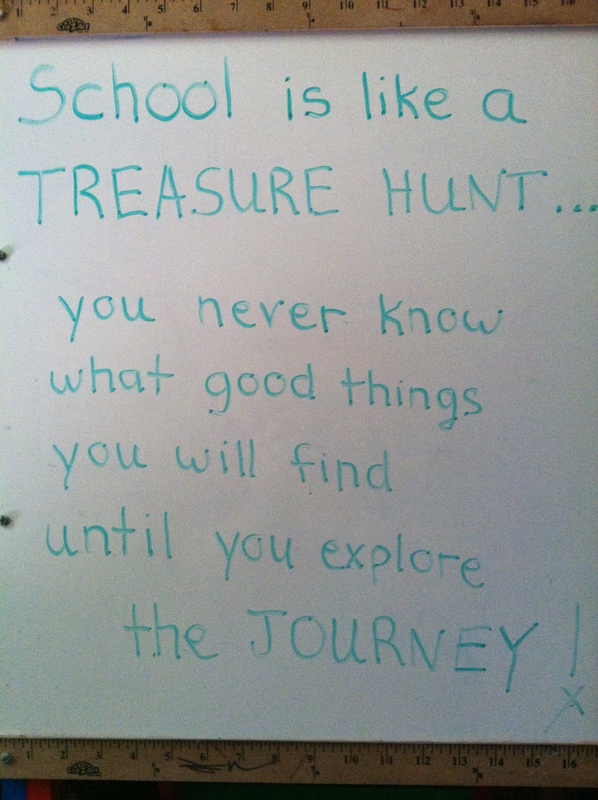 When we got back to the house, I led my kids on a treasure hunt. The clues let them discover things about our property that had gone unnoticed… an apple tree, grape vines, and a pear tree. 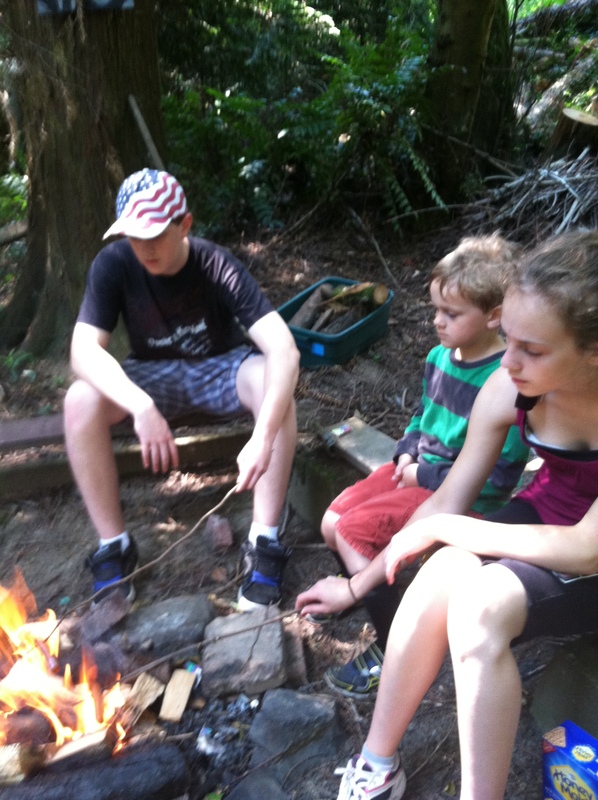 They also got led down around the the trail to the (now very little) creek, which led to our fire pit, where I thought it was brilliant to have hotdogs and s’mores for lunch! I mean, how cool is that, right? Mmm, it was nice idea, but the reality was a little bumpier than that. After sending TJ up the ravine a few time for matches, plates, etc… and me not totally prepared; can’t ya just grab a stick and slap the hotdog on? uh, no, one must carve the tip off with the knife that is in the house which leads to another trip up the ravine! Did I mention it was 90 degrees? *giggle, snort* Of course it was TJ, who carried the puppy down, ran up and down the hill 3 times, and now I am asking him to build a (small) fire. Can I admit he wasn’t thrilled? (oopsies). Love the reminders to see all the beauty always around us. We don’t have to step too far out the front door to see it! Have a great school year!